This has been a great season for a team that was almost a piece of history last year. Now it is time to celebrate you the fan. The Topeka Pilots came into existence when Lamar Hunt Jr. bought the team in the Spring last year. They changed the name and it has been a big hit. 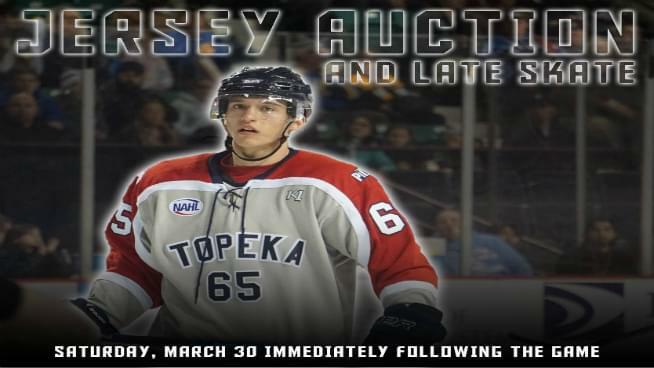 The team is currently in a battle to capture the final playoff spot in the NAHL South. They are only three points back of Corpus Christi for 4th place. March 29th and 30th are the final two home games of the regular season. And the Pilots are going all out this weekend. They are offering $10 tickets for any seat. You can sit on the glass for a discounted price. You can also purchase any merchandise for 25% off! That is a great deal. Then there are $2 beer and soda. That is good for both nights!! Just make sure if you are drinking beer that you designate a driver. On Friday, you can get $2 hot dogs and Saturday is $2 popcorn. 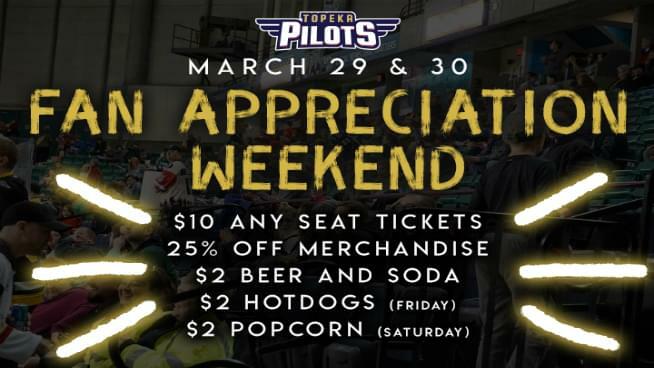 If you want to have some fun this weekend, head down to the Expocentre and catch some exciting Pilots hockey! You can get tickets by going to the Pilots office at the Expocentre.